It’s so flexible that it easily becomes everything you want it to be. was very eager to get acquainted with the new iPad as Apple has promised us quite a few software and technical improvements in comparison to its predecessor the iPad2. Well, the moment has come. In this video review DigitalMagnet is going to introduce to you in details how the new iPad3 performed during the test period. The design of the Apple’s mobile device isn’t anything different from what we are used to seeing from the two older brothers in the tablet family. The chasis is aluminum and the two color options you have are a black one and a silver one. The display tests are maybe the key moment when testing a tablet. As far as graphics are concerned the iPad 3 can be defined with one single word “excellence”. The 9.7’’ LED-backlit glossy widescreen is Multi-touch and features an IPS technology with 16M colors. The resolution of this Retina Display is 2048×1536 or in other words, you have 264 pixels per inch (ppi). The protection of the display is secured by a fingerprint-resistant oleophobic coating – it’s a technology that reduces the oil and fingerprints on the screen, we found the same one on the Sony Xperia tablet S.
Apple says the performance of the new iPad is enhanced as it is provided by a dual-core Apple A5X custom designed chipset running at 1GHz frequency. The graphic card is a quad-core Power VR at 1GHz frequency. But although there is a significant difference in the number of CPU cores in comparison to the iPad’s competition tablets, we actually could not tell it exists as far as performance and graphics were concerned. The operating memory is 1 GB. The iPad3 has 16/32/64 GB of storage variations available to save your ideas, notes, photos, videos, music, movies and all your business information. What is different here is the weight: the new Apple device is 60g heavier than the previous models. The weight is 652g for the Wi-Fi model and 662 for the Wi-Fi + Cellular version. One of the most exciting new additions to the new iPad3 is 4G – it’s supported with micro SIM card and provides mobile ultra-broadband Internet access. 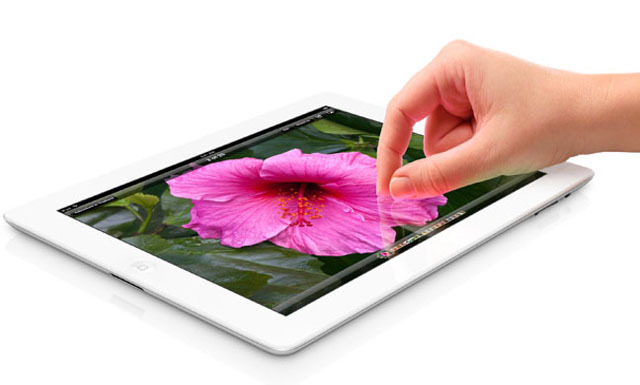 The new iPad features a 5-megapixel iSight camera with advanced lens that opens up to f/2.4 apreture. Its resolution is 2592×1944 pixels. It also provides a backside illuminator, autofocus, face detection and white balance control. The iSight camera also has video stabilization and the iOS6 features a high-resolution panorama feature – with a simple motion you can shoot up to 240 degrees. The video recording is in HD with up to 30 frames per second. To fully enjoy the communication app FaceTime that keeps you connected to your friends and family you have a front-facing VGA camera. At launch the new iPad3 comes with an iOS5 platform but now after the official release of the iOS6 it can be easily updated to the new version of the platform. Need to find your way? Or just looking for a place to hang out with your friends or have a business lunch? Restaurants, stores, movie theaters, clubs it’s all in there and Siri will be always pleased to help you no matter what kind of advice you need. It’s the iOS’s ultimate mobile advisor and helper. What’s more Siri can be guided even by your voice to send messages, schedule meetings or place phone calls. Read something, write something, learn something with the iPad 3 the world is on the tip of your finger. When I say the world I don’t over exaggerate you have about 250 000 apps at your disposal at the AppStore – news, travel, magazines, entertainment, music, games, social networking all on this slim and beautiful retina display with breathtaking graphics. Apple guarantees that your multimedia experience will last long with the built-in 42.5 watt-hour lithium-polymer battery. It provides up to 10 hours of surfing the web on Wi-Fi, watching video or listening to music. You have a two flexible ways to charge you iPad3 via a power adapter or via USB from your computer system. As far as connectivity goes we had some issues during the test period connecting the new iPad wirelessly. We could not connect the iPad3 to an older version of the iPod in order to transfer photos. The music device by the same brand was simply not discovered by the tablet. We were also disappointed by the lack of a direct USB port.